Things are not going the way I expected them to. Unfortunately, the proposed solution to Hibiki’s transformation is stupid and I am not a fan of it. How do you combat the spread of a relic throughout your body when you are at war and not fighting is basically a non-option? Stop fighting and spend time with your best friend in order to retain your humanity of course. My head hurts. Hibiki’s condition has been revealed to everyone. I still don’t understand why they allow Miku to be a part of the secret government organization, but they let her come and go and even tell her about classified information. We are encountering that classic scenario in which a person’s condition will only worsen if they continue to fight. Obviously, Hibiki will return to the battlefield sooner rather than later, but we are going to get the back and forth between Hibiki and her friends before the inevitable occurs. On the other side of things, Dr. Ver has started to take greater control of the operation now that Ma’am’s condition has begun to worsen. He has even gone as far as drugging the divas and forcing them to use their swan songs. Luckily, Hibiki’s Battle Harmonics can steal the swan song power from her enemies as well, so she was able to keep two little girls from destroying their bodies. Oh yeah, and Maria is not the reincarnation of Finé. They think that no one was able to be a vessel for Finé, but it looks like Kirika has been able to take on that role. The final operation is about to begin and the series is heating up. I can’t stand things like this. I am not a fan of what is currently taking place. First off, the way they are handling Hibiki’s condition was taken a step too far in the stupid department. Instead of taking time off from the battlefield and spending time with her friends, they give us that line. It is just a little too cringe worthy for me. I think that this series has a tendency to go too far in this regard and that is what keeps me from saying that this is a great series. There are a lot of good things when it comes to the ideas. 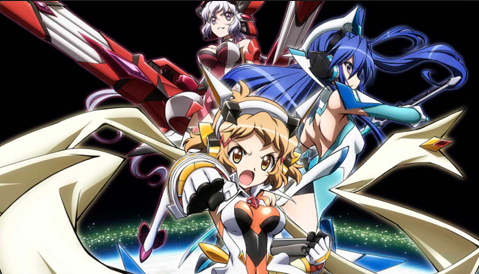 I like the symphogears and the powers that come with them, but there isn’t a heavy enough focus on something that was heavily built up in the first season. The one taste of it that we got in this episode was just a tease because Hibiki stopped the swan songs. Even though Hibiki showed off the true power of battle harmonics at that point, it was not used offensively. Even though I enjoy the action in this series, I don’t even think the lack of action is the main flaw here. It is the writing in general. They do unnecessary things that take away from what is actually going on. I just wish that they took themselves seriously for once. Who else thought that Ma’am might have been Finé? Did anyone think that they were building up to Shirabe being Finé? Well, the dark horse candidate has made it through and it is Shirabe. At least I think that is what the barrier and lack of reaction to the drug symbolizes. I guess that losing yourself is a major theme in this series. How far will you plunge yourself into the darkness before you start to lose sight of your original goal? Am I willing to give up my own humanity in order to fight for others? Am I willing to give up my best friend if it means saving others? This is basically what the series is boiling down to at this point. Unless Miku gives it up, people are going to see her as a selfish character. High schoolers may lack maturity, but there is no way things are going to get resolved with Hibiki on the battlefield. On the other hand, our anti-villains are questioning themselves once again. I wonder what there plans are exactly. Also, that Dr. Ver guy is creeping me out. I can see him dying in the final stage of the unknown operation. Oh yeah, and this series really hates the United States. I don’t blame them, but they do have the fate of the world at stake. I need to see some actual attention brought to the fact that the moon is falling.